A barn-raising in the heart of Detroit? That’s certainly what it felt like as activists from across the region gathered in Highland Park on Sunday, June 26, to construct a 2000-square-foot hoop house from plastic sheeting and metal tubes. This solar-powered greenhouse can grow food year-round—even in Michigan winters. Armed with the right equipment, it doesn’t take more than a day to construct one. As UniverCities Energy Data Intern Jordan Eizenga and other Suburbs Alliance staff found, it does take a number of willing hands. 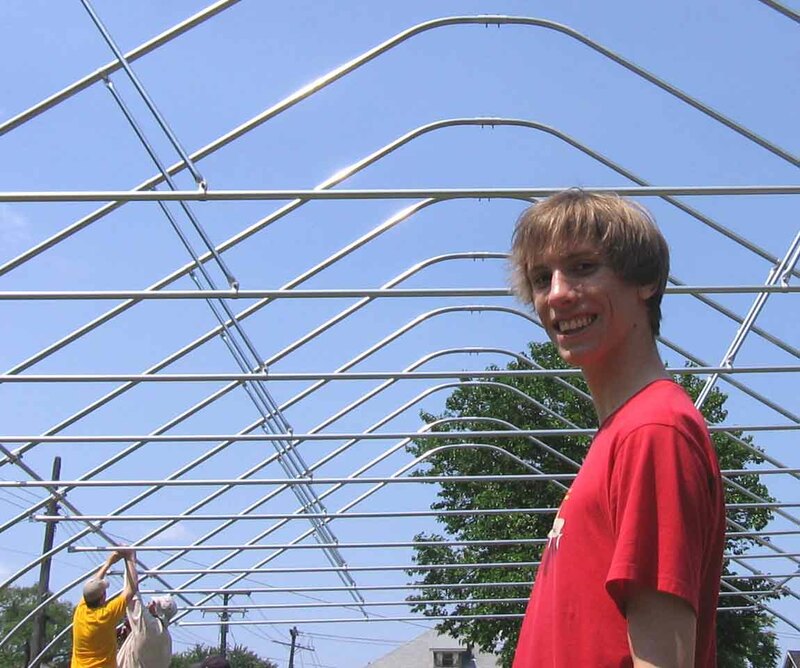 Jordan Eizenga is framed by the house’s metal structure. Jordan (not to be confused with Energy Policy Intern Jordan G.) found lending his hands easy enough. He moved to Ferndale this summer to be near the Suburbs Alliance main office, and biked the few short miles along Woodward Avenue from Ferndale to help build the house. The site was behind the Green Economy Leadership Training (GELT) house near Woodward and McNichols. 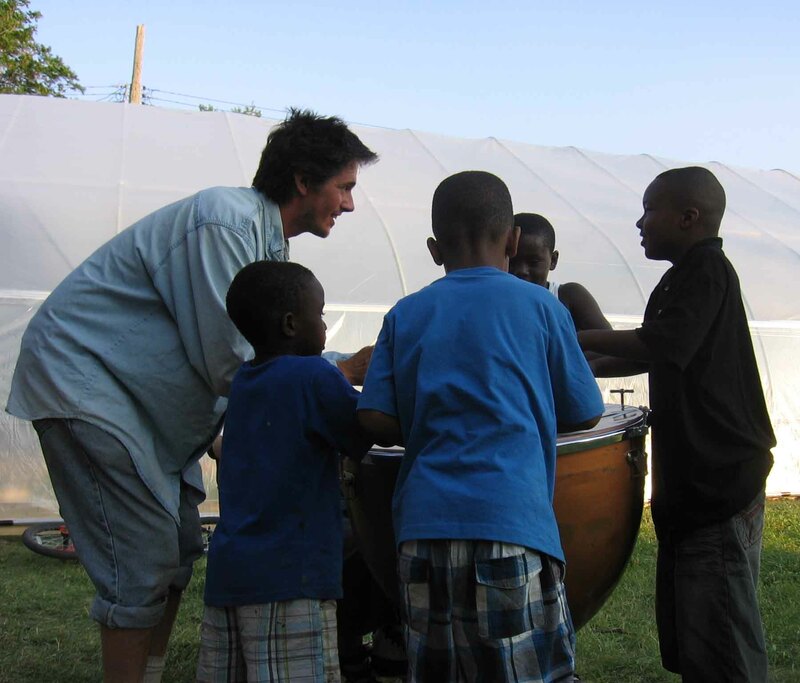 A branch of a national youth network organizing for solutions to global climate change, GELT seeks to give young people a holistic understanding of the transition to a sustainable, community-scaled economy through neighborhood projects like the hoop house. Things heat up in the hoop house’s interior. By late morning, most of the metal hoops that formed the hoop house’s structure were already in place, and the lot was a hive of activity. 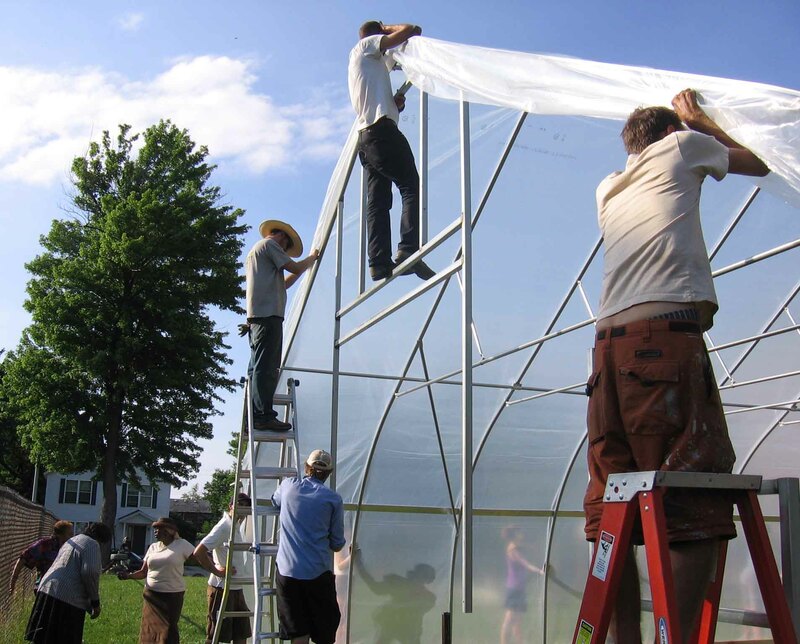 Builders included master hoop-house mechanic Jeff McCabe, co-founder of Ann Arbor’s SELMA Café, Margaret Lewis, publisher of the Highland Park-based Legacy News, and scores of others from the block, the neighborhood and the greater region. Now that’s metropolitan cooperation in action! While at rest, the group traded farming tips and enjoyed impromptu rapping from the youngest attendees. The plastic sheeting has been hauled into place. “Billow it!” As the sun sank lower, the team gathered on either side of the curving metal frame to push and pull the plastic walls of the house into place, sending ripples through the giant sheets to carry them over the top. Slowly, under the careful hands of Jordan and two dozen others, the double sheets slid down to meet the wooden frame near the ground. What had been empty space open to the elements at dawn became a warmer interior where plants will grow come winter. Collective celebration with the help of a timpani. 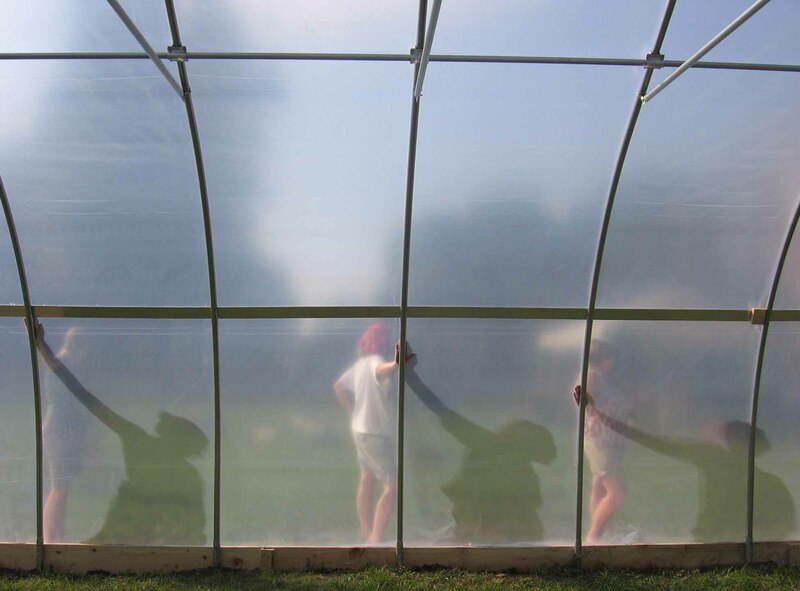 There’s much more to be done before the hoop house produces its first crops. For Jordan and the other six Suburbs Alliance staff on hand, though, the day was an inspiring confirmation that people from all over the area can come together to build a healthier, greener and tastier future. Working cooperatively, the group built in one day what a single person couldn’t have constructed alone. Metro Detroit needs to bring that lesson to a regional scale: we’re stronger together. Welcome. Please understand I take writing this article very seriously. Being a caretaker is a family tradition. I am the messenger telling you about some of the angels of Richardson. Their tireless, compassionate commitment to this charity. Thanks to all the GELTers, Parkers and everyone who made this inspiring day possible!